What do spiders and velcro have in common? Note: all photographs (unless otherwise indicated) are used with permission from Sean McCann. Acoustic communication is common in spiders, but the vibrations are usually transmitted through a substrate, like the ground, leaves, or webs. Spiders detect substrate-borne vibrations with highly sensitive receptors on their legs. In other words, spiders don’t have ‘ears’ or hear in the way that humans do, while we are generally deaf to the sorts of acoustic communication signals they are sensitive to. As a new tweeter, I was excited that I could answer this question, having recently read a book chapter by Gabriele Uhl and Damian Elias on spider communication. 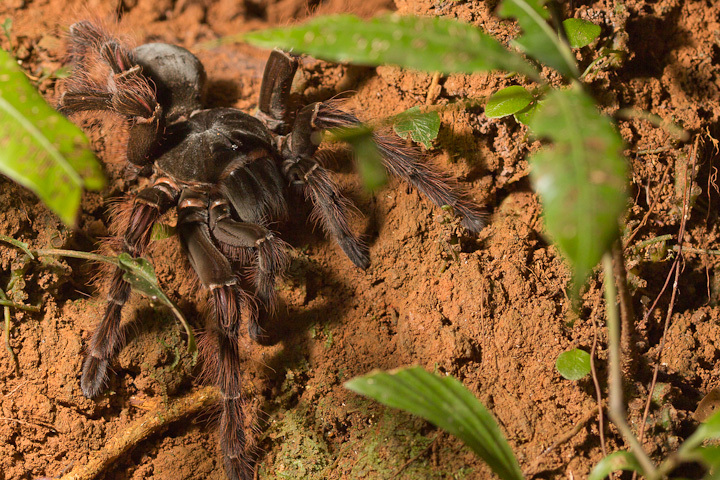 They mentioned a tarantula called Theraphosa blondi, or, commonly, the Goliath Birdeating Spider (don’t worry, more about this intriguing name later) producing a defensive hissing sound like a snake. Importantly, this audible (to humans) sound occurs during communication with vertebrate predators, rather than other spiders. Recently, I read the original paper by Marshall et al. (1995) describing the mechanism of sound production by Theraphosa blondi, which will be the topic of this post. First off, a little background on the ‘Goliath Birdeaters’. 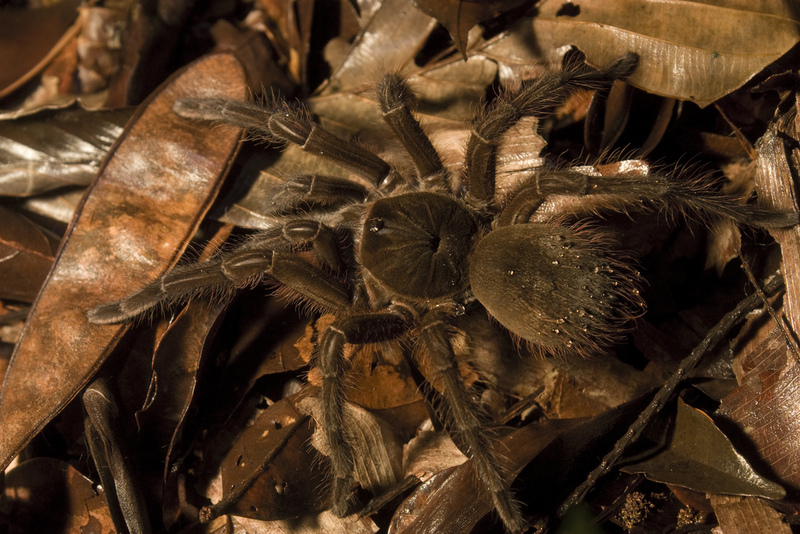 There are two species: Theraphosa blondi (or leblondi, depending where you look) and Theraphosa apophysis. I had the pleasure of meeting large females of both these species while in French Guiana doing some field work on army ants with Sean last winter. 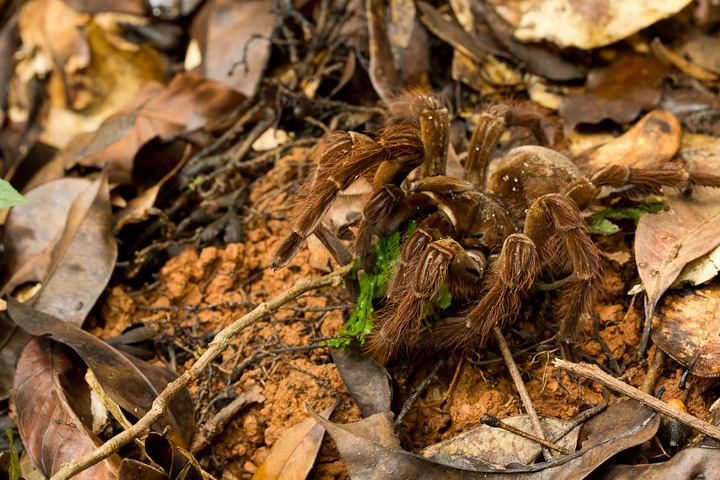 Female Theraphosa blondi in French Guiana. A quick spider anatomy lesson: spiders have two body segments – the front one with the legs is the cephalothorax (sometimes called the prosoma) and the rear one is the abdomen (or opisthosoma). In addition to 4 pairs of legs, the front-most pair of appendages are modified legs called pedipalps (sometimes just palps). Notice the hairs on the rear of the abdomen – these are the defensive urticating hairs mentioned later. The Goliath Birdeaters live in burrows. Tarantulas (members of the family Theraphosidae) don’t build webs, but here you can see the silken ‘doormat’ that extends from the silk-lined burrow of this T. blondi female. We tried to lure her out by twisting a twig around on the silk mat at the burrow entrance. The spider detected the vibrations from the movement of our stick through her legs, which are always in contact with the silk lines. Presumably we did a passable job of imitating a prey item, as she soon rushed out of the burrow to attack, biting the stick. Her fangs were impressive (about 2 cm long) but the venom of these spiders is not that potent – a bite is apparently not much worse than a wasp sting. 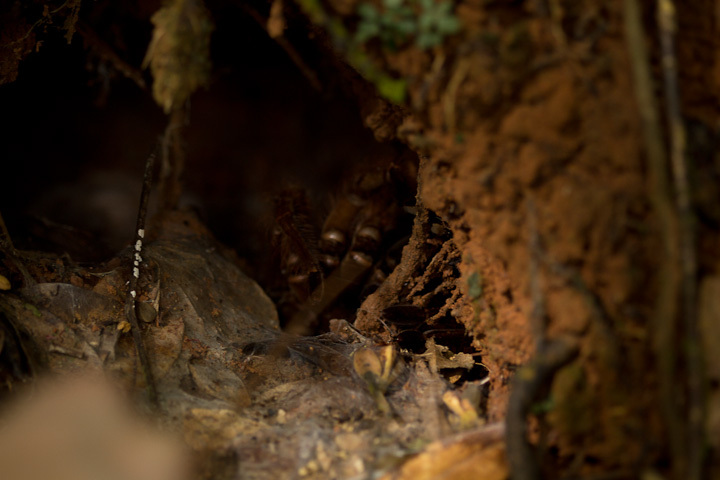 Female Theraphosa apophysis outside her burrow. This spider has evidently seen some rough times, having lost her last two legs on her left side. The ‘goliath’ part of the name is appropriate: they are extremely large. 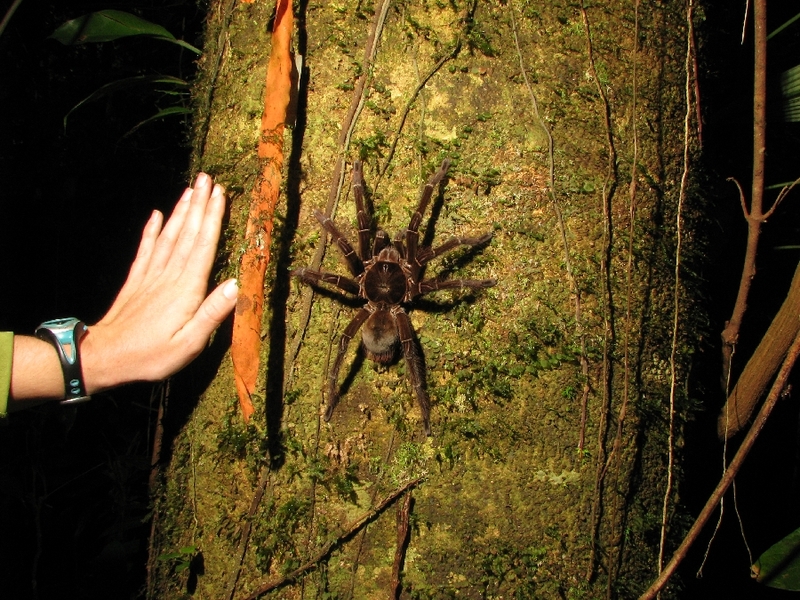 A Theraphosa blondi female next to a woman’s hand for scale. As for ‘birdeater’, like most spiders, they mainly prey on insects and other arthropods. They have also been reported to take juvenile toads, skinks, snakes, mice and earthworms, but rarely birds*. Spiders have predators themselves, which is where defense mechanisms come in handy. Tarantulas in the New World employ urticating hairs in defense against predators such as small mammals. 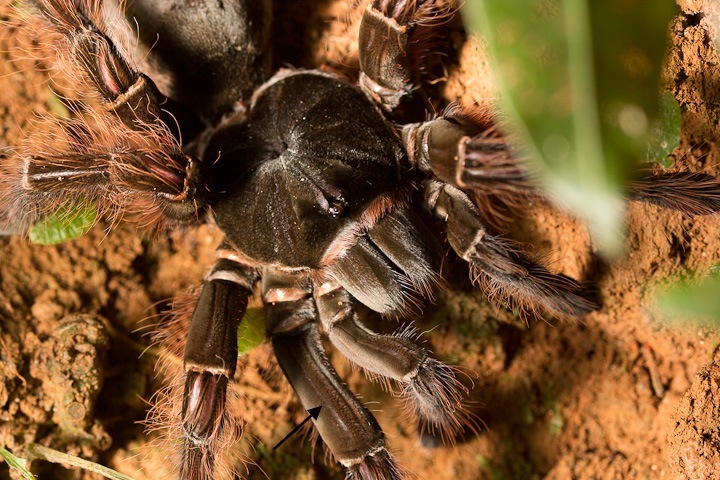 These barbed bristles on the spider’s abdomen are brushed off with the last pair of legs in the direction of an attacker and can result in severe irritation of the skin and mucosa. Coatis (members of the raccoon family) prey on tarantulas and apparently use tactics that allow them to avoid being injured by their prey’s urticating hairs. 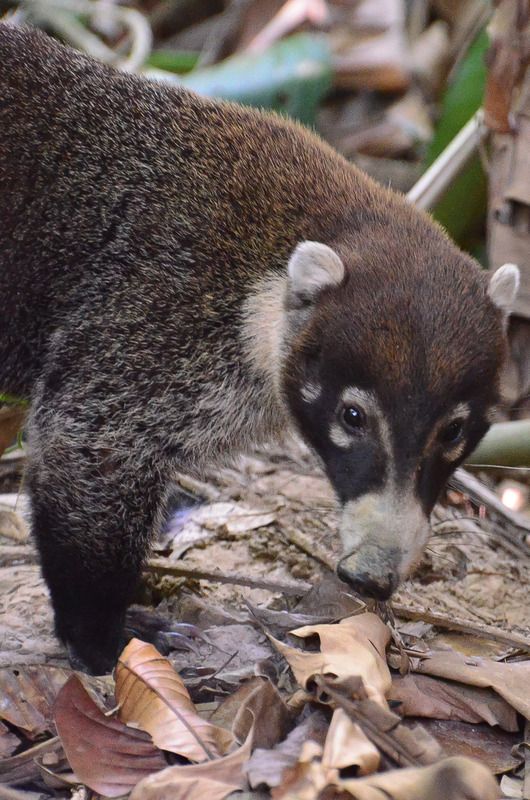 Coatis have a severe reaction to the hairs of Theraphosa blondi, however, and seem to recognize and avoid them. The authors of the paper suggest that the hissing sound the spiders produce is an acoustic aposematic (warning) signal that works in combination with the urticating hairs to provide an effective defense against vertebrate predators. The point of their study was to figure out exactly how these giant spiders hiss. When the researchers looked closely**, they found that the spiders have many plumose setae (tiny hooked hairs) on the femora of their pedipalps and first two pairs of legs. When threatened, Goliath Birdeaters rear up and rub these leg and pedipalp segments together. Theraphosa apophysis. The arrow indicates the femur of the right first leg. The plumose setae referred to in the paper are on this leg segment as well as on the femora of the pedipalps and second pair of legs. So basically, although Goliath Birdeaters don’t really eat all that many birds, they have a nifty trick for avoiding being eaten themselves. They use a velcro-like technology to make a hissing sound that warns potential predators that they are dangerous and painful to attack. Pretty awesome. *I haven’t been able to track down any references for this, but I have read in a few places that the original species description for Theraphosa leblondi included a record of the spider having taken a hummingbird. **The figures in the original article Marshall et al. 1995 (paywalled) include close-up images of theses structures. For (non-paywalled) images of stridulatory setae in another Theraphosid see Pérez-Miles et al. 2005. This entry was posted in communication and tagged bird-eating spiders, Tarantula, Theraphosa blondi, Theraphosidae by cataranea. Bookmark the permalink. Welcome to the blogging world! I look forward to seeing what you have to say! I have the feeling I’m going to learn a lot about spiders while you’re writing your thesis! Great post. Really captivating story. Oh and thanks for the linkback. Thanks Adam (for the feedback, and the photograph)! And you’re most welcome!